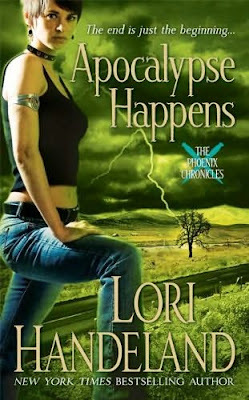 Thanks to Michelle at Michelle's Book Blog - she uncovered this gem of a cover for Lori Handeland's third Phoenix Chronicles novel - Apocalypse Happens. I just love that title. Arriving in book stores November 3, the fourth book called Chaos Bites will be out in Spring 2010. Elizabeth Phoenix is one of a select few with the power to battle those who have escaped from the darkest level of hell—demons bent on destroying humanity and reclaiming earth once and for all. Liz is determined to stop yet another Doomsday. But this time, it’s going to be more difficult than ever because someone she thought was dead isn’t dead anymore…and is bound and determined to destroy Liz and everyone she loves in the upcoming Apocalypse. BUT CAN SHE CONTROL THE DARKNESS WITHIN HERSELF? Liz has arrived in Los Angeles to ferret out a nest of varcolacs: half human, half dragon creatures who crave the destruction of the sun and moon. But before she can prevent the kind of eclipse that would bring the world to an end, Liz must mine the depths of her own heart. She and her former lover Jimmy Sanducci have some personal demons to battle—and there’s always her mentor, the Navajo shaman Sawyer. Is he on their side or isn’t he? In the end, the three of them must find a way to fight together…or perish alone. I bought the second book (didn't know about the first one) started reading it, then realized that there must be another book out there. So I stopped reading it, and finally found the first book. Haven't been able to get around to it yet, but it's waiting for me. Nice to know there will be a third and fourth out there too. The titles always grab me. I can't wait to read this. Thanks for the mention. :) I think this cover is my favorite so far...and I love the title as well. Wendy they are a nice set of covers style wise. I think I like this one the best of the three. Thanks Mardel. I am the reverse, I have read the first book and the second is in my TBR pile which I hope to get to before this one is out. Vickie this particular title is a grabber. Great play on words. Hey Michelle you did all the hard work. I didn't realize Lori doesn't have a blog (does she?) and I forget to check author sites with no blogs and always miss stuff like this. Another great find! I love this author and can't wait to pick this up. I love title Chaos Bites, it certainly does. Dottie she knows how to pick snappy attention grabbing titles. I liked the first book but that's all I've read so far. Cover Art - "Zombie Raccoons and Killer Bunnies"
Steampunk and "The Clockwork Century"
Will the Absurdity Never End?